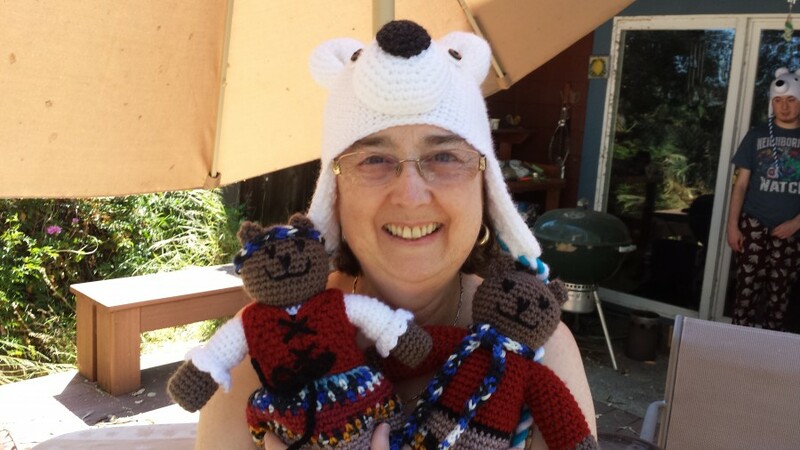 Jan has crocheted 3 polar bear hats and 2 Scandinavian-themed bears to bring with us to Worldcon in Helsinki for fun and some photographs. We're hoping we might meet up with travelswithkuma there for a joint photo. Afterwards, the two Scandinavian bears (named Emilia and Johannes) will be donated to the Mother Bear Project to be given to children in Africa who have been affected by HIV/AIDS. (See http://www.worldcon.fi/files/agenda_2017.pdf for the agenda items and text. Current text of the Constitution is at http://www.wsfs.org/wp-content/uploads/2017/07/WSFS-Constitution-as-of-August-22-2016.pdf ). Rationale: E Pluribus Hugo (EPH) was one of two anti-slating provisions ratified by the MidAmericon II business meeting. EPH+ is effectively the “extra strength” version of EPH – it has a stronger anti-slate effect than pure EPH (averaging around one extra non-slate nomination per category for slates of various sizes in one study), but it also can change the results more in the absence of slates. A bit over a week ago, I wrote a couple of comments in response to Stuart Wilson on this thread on the Mary Sue about the movie Passengers. Unfortunately, part 1 got tagged as spam by Disqus, and part 2 doesn't make as much sense without it. So I'm going to put the whole thing below, so that I can link to it online. This is in response to the question of whether or not the film adequately explains Aurora's final decision. I think it does make emotional sense to me, and this is why. It's still true that parts of the ending are a bit hokey, and the film would benefit by showing us more of Aurora's perspective (the "Passengers Recut" YouTube video has some good ideas), but I think the characters do hold together. I think the movie does explain why she forgives him, but it isn't overly explicit about it, and a lot of it goes by really fast during the final extended action sequence, so it's easy to miss. The short version is that I see her becoming able to forgive him by first confronting the darkness within herself, her own fear and desperation, which allows her to empathize with what he did. I think the first key moment is when Gus likens what Jim did to the actions of a drowning man. That's a bit dismissive of Jim's responsibility, which was more premeditated action than the reflexive actions of someone drowning, but the scene is followed shortly thereafter by Aurora experiencing her own near-drowning experience when the gravity generator fails. That experience makes the metaphor real for her, letting her feel desperation in a very visceral way, which has to affect how she thinks about his actions going forward. Next there's the extended scene in the engine room, where they have to work together to save the ship, and where he ultimately is willing to sacrifice himself to save her and the rest of the passengers. That forces her to confront the prospect of being left alone on the ship as he was, and it's clear that the possibility terrifies her, as she works to bring him back. She has to confront her own feelings of fear and loneliness, even though she does it quickly without letting them paralyze her. And then, finally, he is able to offer her meaningful restitution for the choice he took from her. He has found a way to put her, and only her, back into hibernation for the rest of the voyage, and he offers to do it. By then, having confronted her own fear, desperation, and loneliness, she can fully understand what the offer will cost him. But he has restored the choice and the agency that he took from her, so that her final decision is a truly free choice. We don't know how long it takes for her to make that final decision. There's an indefinite time skip between the scene where he makes the offer, and the next scene at the bar. But I think that we don't need to fall back on Stockholm syndrome to explain why she chooses to reattach. She was already falling in love with him before she discovered his betrayal. By confronting the darkness within herself, she has become capable of empathizing with his situation, and truly forgiving what he did. And he has now twice demonstrated that he can act unselfishly for her benefit, in contrast to the selfishness that led him to take away her choice in the first place. In restoring her choice, he makes it possible for her to consider loving him again. Another thought about the ending of Passengers: think for a moment about how selfish and shallow Aurora’s initial goal for the trip was. If she legitimately analogizes what Jim did to a kind of murder, then what she had planned for herself was a kind of double suicide, where she would twice become dead to everyone who had ever known and loved her, all for the sake of the book she planned to write about the experience. Those friends who recorded the farewell greeting to her will be dead and gone long before the ship makes landfall, never having heard from her again. Then she plans to do it again to her new society, counting on her money and the notoriety from her book to allow her to reintegrate into a future New York where no one who hasn’t read her book has any idea who she is. In restoring her choice to her, what Jim makes possible is a different kind of life to write about, and a far more compelling book about experiences no one else will ever have, the back story behind the founding of a new society, and life with the guy who gave her the stars. As a bonus, there’s a chance that her friends back in New York will get to read the opening chapters before they die, and learn what she has made of her life. Instead of a dilettante’s book aimed at would-be dilettantes, she’ll be writing the origin story for everyone in the new colony, about the people to whom they all owe their lives and future existence. Is it really so difficult to believe that the Aurora who has grown through the latter part of the movie might make that choice? If there were any significant merit to the central premise of the various "puppy" incarnations - that SF awards have recently been taken over by a cabal of so-called "social justice warriors," to the detriment of the works honored and the overall field - you might expect that the best-positioned person to notice it would be someone who had just suddenly returned to reading current works in the field after a 20+ year absence. Someone, that is, much like me. As I noted in my previous post, I basically stopped reading most new SF and paying attention to the Hugos after the birth of my son Kern in 1992. I didn't stop reading SF altogether - rather I was mostly seeking out and re-reading the stories and authors of my youth to share with my son as he got older. As soon as he was old enough, I introduced him to Tolkein, and to Asimov's Foundation trilogy. Later, he returned the favor by sharing some of his enthusiasms with me. I did catch a few contemporary novels - we read the Harry Potter series together as a family as they were published, and I did read A Song of Ice and Fire some time after A Dance With Dragons came out. But for the most part, my reading in this period was originally published pre-1993. So what does the state of SF look like to someone emerging from a long hibernation? It's surprisingly familiar, actually. I enjoyed all three of the non-puppy nominated novels this year. Overall, it seems like there is more urban fantasy themed stuff out there, and a bit more diversity among the authors. But I see a definite connection between the works I was reading and enjoying back in the 60s, 70s, and 80s, and the non-puppy stuff that got nominated this year. Conversely, I wonder what the Puppies were reading that leads them to think that a concern with social justice themes is a recent innovation in SF. Did they ever read The Forever War? The Left Hand of Darkness? Heck, did they ever read Stranger in a Strange Land? Hugo-winners all, that bunch. Have they read anything by Alice Sheldon/James Tiptree Jr.? Ursula Le Guin? Joanna Russ? If there's an earlier age that the Puppies are hearkening back to, where white male concerns went largely unchallenged and a rocket ship on the cover meant you could count on a simple space adventure, it would be the 50s and earlier, a time when several of their leading figures weren't even born. And even so, I suspect that is something of an oversimplification. If you had asked me, back in January of 2015, how likely I was to spend part of my summer at WorldCon in Spokane, I would likely have laughed. If you had asked how likely I was to go primarily to attend the business meeting, I would have laughed harder. I had never been to an SF Con before, never been a part of organized fandom, and hadn't even been paying much attention to the Hugos ever since I let my subscription to Asimov's lapse back in 1992, the year my son was born. The closest I'd ever gotten to organized fandom was attending a couple of readings at Greyhaven in Berkeley many years ago, when a friend was reading some of her short fiction there. But the puppies changed that. When I heard that they had taken over several categories on the Hugo ballot this year for political reasons, I got pissed. It didn't seem fair that a small group of around 15-20% of the nominators was able to control 100% of the ballot. I remembered how much the Hugos had meant to me growing up, when the lists of winners and nominees had formed a recommended reading list for me at the library. I got angry that someone was trying to devalue that, and got angrier when I got to know more about some of the history of Vox Day and what he stood for. I went to various blogs to find out what was happening. I got involved in the discussions over at Making Light about the E Pluribus Hugo amendment as a possible solution and as a constructive way to channel that anger. Ultimately, I decided to shell out for two attending memberships for me and my son so I could come to the business meeting at Sasquan and vote for EPH. We had a great time. I got to meet some of my favorite authors and make new friends. I've now paid for attending memberships to MidAmericon II for me and my son, so we can go next year and vote for ratification. We're also talking about maybe taking the whole family to Helsinki in 2017, and I'm planning to vote for the San Jose WorldCon bid for 2018 in the hopes of getting to go to a WorldCon close to home. So in a backhanded way, I can thank the puppies for connecting me to WorldCon fandom, and for getting me to read more contemporary SF so I can vote and nominate intelligently for the Hugos. I've come to realize just how much the Hugos have meant to me over the years, and I'm glad to be able to help keep them representative of the broader interests of fandom.